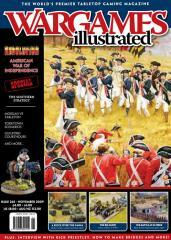 #265 "American War of Independence Special"
American War of Independence theme, we present an overview of the action. If Greene and Cornwallis are the stars of the southern campaign, then Tarleton and Morgan would be the supporting actors that helped make their performances legendary. We examine the roles played by the two generals and present a scenario for a clash of the two forces. Descriptions and painted examples of what both sets of protagonists wore during the southern campaign in the AWI. At this year’s Historicon show Joe Moore put on a refight of one of the critical battles in the American Revolution’s Southern theater - Guilford Courthouse. We were glad to ask Joe to tell us more about the whole experience. Battle of the Capes, and the following siege and capture of Yorktown. This article features wargames scenarios for actions during these world shaping events. Some suggestions for your AWI game play. Exploring the idea, and problems, of using heavy artillery on the WWI tabletop. Last month we discussed how to employ reconnaissance forces in Flames of War, this month we put those rules and tactics into practice in a scenario and game report which sees the British 2nd Household Cavalry regiment clash with a German force defending a vital river crossing. Our ‘how to’ modeling series continues with a step-by-step guide to constructing a range of different bridge types. This month sees the release of Black Powder, the new ‘age of the musket’ rule book by Warlord Games. We chat with games designer and Games Workshop rules supremo Rick Priestley about the game’s ethos and mechanics. By way of showcasing the rules, and as an excuse to display a great Peninsular War game, we present this extract from the new Black Powder rule book. Plus a visit to the Festival of History in the UK and our monthly roundup of News and Reviews.